Since January 1997, the American Jewish Historical Society has published a weekly newspaper feature entitled Chapters in American Jewish History. The present volume offers 120 of the best columns, organized according to subject and period. 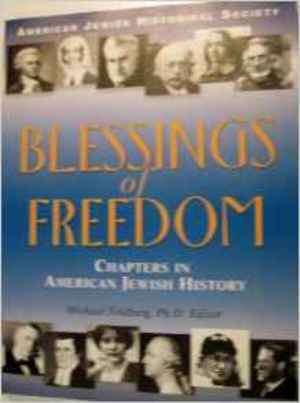 Blessings of Freedom is not a complete history of American Jewry but a collection of vignettes and episodes that taken together illustrate the overriding directions and tendencies of the much larger tapestry that comprises the American Jewish experience. Each chapter is a window on an interesting and illuminating glimpse at an important and often colorful aspect of the American Jewish story. Bibliographical information is given for those interested in learning more about the topic. Blessings of Freedom is recommended for young adults in addition to adult readers.